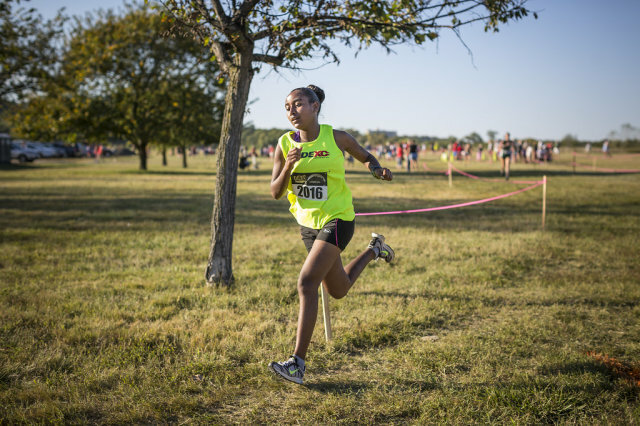 More than 1,900 high school cross country runners christened the inaugural DCXC Invitational at Kenilworth Park in Northeast D.C. Saturday afternoon. They came from Virginia, Maryland, D.C., Delaware, Pennsylvania and North Carolina and battled for five hours on a warm fall afternoon. [button-red url=”http://dcxc.s3-website-us-east-1.amazonaws.com/#/team_totals” target=”_self” position=”left”] Team scores [/button-red] The meet split up varsity teams among classes, giving spectators eight chances to watch runners race against their peers. The format also switched up the invitational style in the middle of the season. Each race scored three runners, and the results compiled for all races led to Virginia’s James Madison winning the girls’ races over Lake Braddock, Ocean Lakes, Bethesda-Chevy Chase and Winston Churchill; Lake Braddock won the boys’ team title over Pennsylvania’s Cardinal O’Hara, Winston Churchill, James Madison and Gonzaga. Lake Braddock also won the combined boys’ and girls’ team title, over James Madison, Winston Churchill, James F. Robinson and Bethesda-Chevy Chase. With their races done and cooldowns complete, younger runners were able to line the course for the seniors’ races, and be recovered and ready to celebrate. 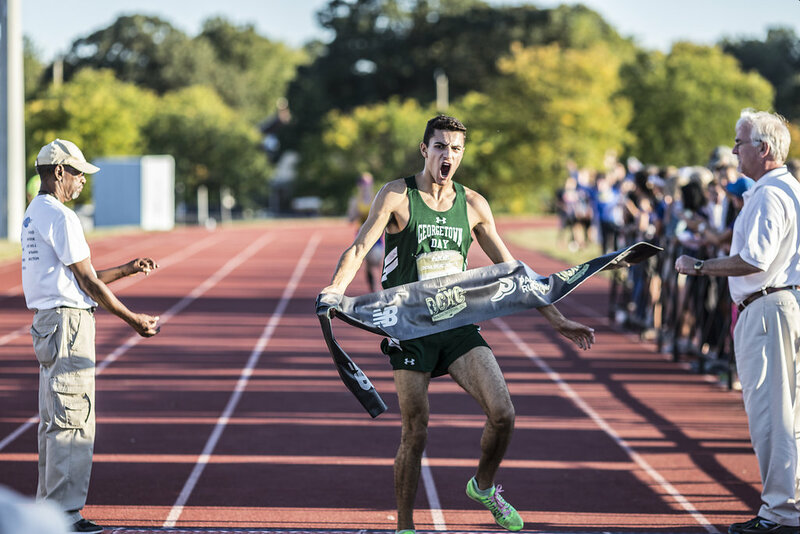 As soon as Georgetown Day School senior Aidan Pillard crossed the line in 15:56, junior teammate Tristan Colaizzi grabbed, him, picked him up and swung him around in exultation like a sweaty rag doll. Promising freshmen who aren’t necessarily at the front of big races had a chance to stand out, as did freshman Josh Fry of Bethesda-Chevy Chase, who usually finishes seventh on his team’s varsity. The field sizes also played a role. 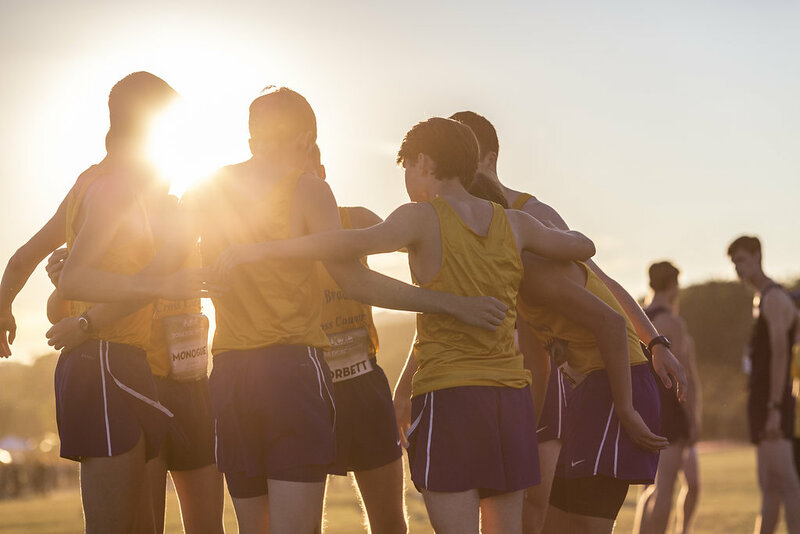 “Instead of running in a pack of 10, you wind up with three or four,” said James Madison senior Amanda Swaak. Lake Braddock, which faced fields of 600 the weekend before, found the starts a lot more manageable. The two loop course was flat but not smooth, which delighted runners coming off of the hilly Oatlands Invitational a week before. 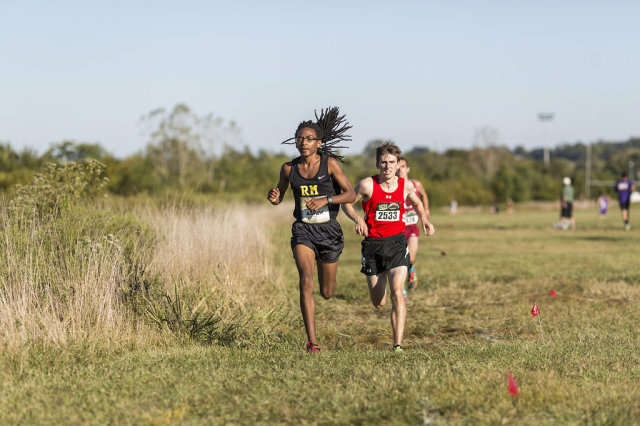 Senior Anteneh Girma had enough of the hills that came with many of the cross country courses his T.C. Williams’ team had run this year, so the relatively flat DCXC course catered to his strengths, none moreso perhaps than the roughly 300 meter finish on an all-weather track. He cranked out a 15:24 to finish fourth in the last race of the day. 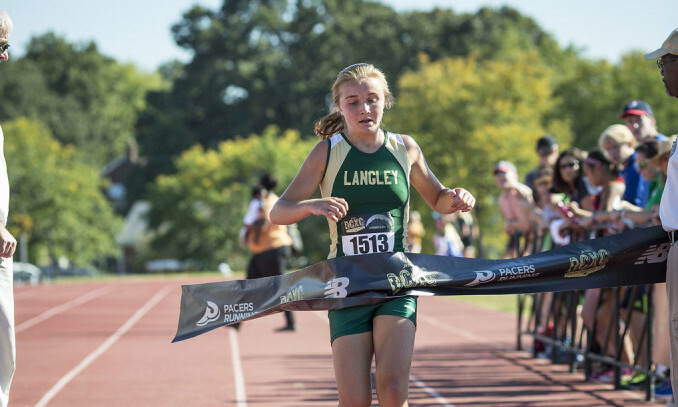 When Sophia Divone showed up to join Langley’s cross country team, coach Gifford Krivak threw her into practice and saw before his eyes what his team had. “Within a few days she was running with the boys,” he said. It helped that she had years of Junior Olympic swimming building her endurance, along with a mother who ran in high school and a father, Chuck, who has run three marathons. “It started as her running with me, then me running with her, then me running behind her,” he said. [button-red url=”http://dcxc.s3-website-us-east-1.amazonaws.com/#/home/afrg” target=”_self” position=”left”] Freshman girls results [/button-red]Divone’s debut race was inauspicious, with her getting lost at the Monroe Parker Invitational. 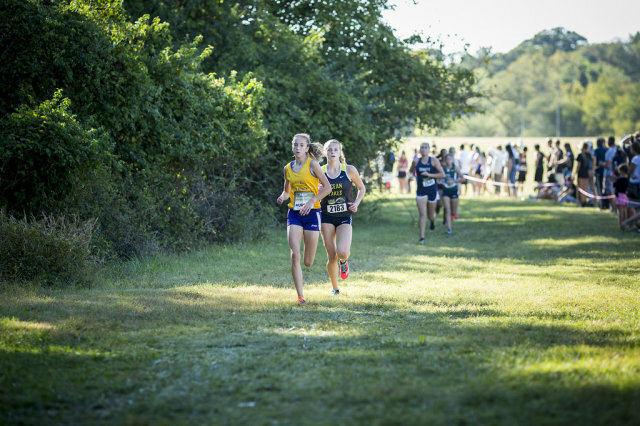 She started the DCXC race cautious about the heat, and hung back with Georgetown Visitation’s Micaela Kirvan (second, 20:17) and Richard Montgomery’s Nefrit El–Masry (fourth, 20:42) before taking off to a 11-second lead over Lake Braddock’s Sarah Daniels (third, 20:20) by the second mile mark, and by the end she had a 13-second margin over Kirvan to win in 20:04. Where’s Divone’s time made her the fastest Saxon at the race by more than two minutes, Kirvan and Daniels each got a chance to shine for their teams among their peers. Georgetown Visitation coach Kevin Hughes intimated that Kirvan had earned herself a spot on his team’s varsity. Daniels’ performance this season, putting her fourth on the Bruins’ varsity team, has earned her a trip to Florida to compete in the Walt Disney World Classic in two weeks. His kick made all the difference for Poolesville’s Ryan Lockett (17:01). He put two seconds on Gonzaga’s John Colucci in the last 150 meters to kick off team scoring for the boys. He was planning on kicking the whole time, he said while shaking hands with seemingly every freshman boy he raced a few minutes prior. Like Meghan, Ryan Lockett participated in Frederick, Md. youth track in preparation for his high school career, though his father Chris said DCXC had been his biggest race so far. [button-red url=”http://dcxc.s3-website-us-east-1.amazonaws.com/#/home/afrb” target=”_self” position=”left”] Freshman boys results [/button-red]The pair separated themselves from the field by eight seconds at the mile and ended up almost a minute ahead of third place Josh Fry, of Bethesda-Chevy Chase (17:58). Colucci was only three seconds off his PR, set two weeks before. He ran as an eighth grader, and is still adapting to high school racing. 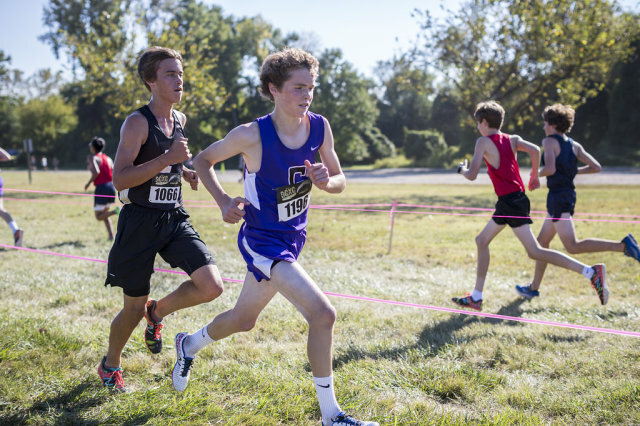 Fry, who typically finishes seventh overall for the Barons, passed a pair of runners in the third mile and relished the chance to race purely against other freshmen. Left to her own devices, Isabelle Oliver did alright. 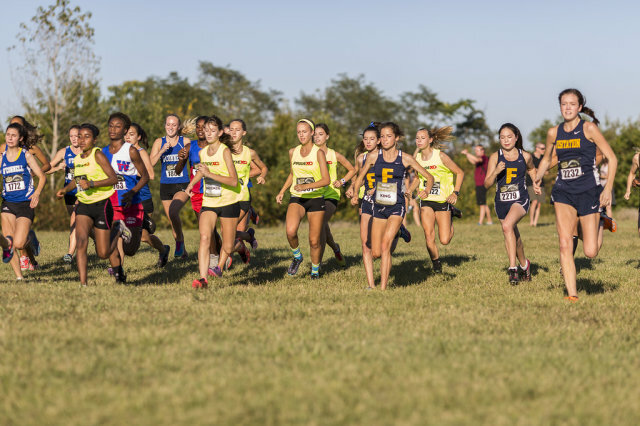 Her team, the tiny Trinity School in Fairfax County near Falls Church, put every one of its runners in the junior varsity races but her. Though she lined up by herself, she wasn’t alone as she ran to an eight-second margin of victory in 19:07. [button-red url=”http://dcxc.s3-website-us-east-1.amazonaws.com/#/home/asog” target=”_self” position=”left”] Sophomore girls results [/button-red]After some second-mile letdowns, Oliver resolved to run hard through two miles and see where that put her. As it turned out, it put her two seconds ahead of Lake Braddock’s Kate Murphy, whom she would go on to best by 16 seconds. During the summer, while adding to her mileage, the sport clicked for her. Rohann Asfaw is off to a fast start in 2014, leading his Richard Montgomery team and winning the Frank Keyser Invitational in Boonsboro, Md. the week before DCXC, where he prevailed over Griffin Mackey by five seconds in 16:23. The key to his breakout fall? His summer training. And not just getting in the miles. Mackey recovered to run 35:10 to win the Perfect 10k in Reston the next morning. Third place finisher Ryan James (16:43) is typically the second fastest runner for the Cardinal O’Hara team from outside of Philadelphia. Anticipation built over the week leading up to DCXC. [button-red url=”http://dcxc.s3-website-us-east-1.amazonaws.com/#/home/ajrg” target=”_self” position=”left”] Junior girls Results [/button-red]Just how fast was Weini Kelati going to run? With her shoes tied tight enough that she wouldn’t have to stop? And with fewer hills than the Oatlands Invitational, where she made her debut for Leesburg’s Heritage team seven days before? How would the IAAF World Junior Championships participant follow up her debut? The answer was 17:45, and quite impressively. Green Hope’s Elly Henes went with her for a mile, in 5:22, but Kelati pulled away soon after to run the fastest girls’ time of the day. “No hills this time, but there was a lot of heat,” she said, noting she liked the finish on the track, were she is more comfortable. Fifth place Georgie Mackenzie lost a shoe with a half mile to go at Oatlands last week, but kept them on at DCXC, though she still dealt with rough terrain on the course. Henes’s team came from Cary, N.C. looking for a good race, and she feels like they got one. 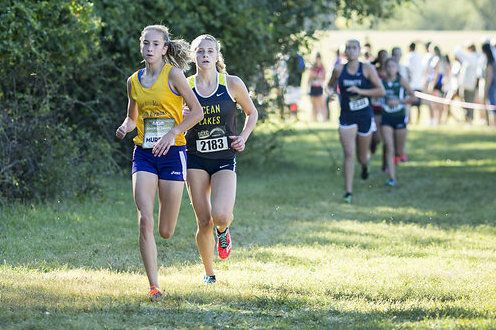 Though her 18:11 runner-up time didn’t match her sub-18 time from the prior year’s state championship, she felt like she handled the course well. She looked forward to taking a swing at Kelati, and didn’t back down. Sami King, already the Field School’s (in D.C.) top runner in team history, saw the course’s challenge coming from the sharp turns. “They threw me off a little, but I got better as the race went on,” she said. A long pause on the starting line built up tension, but King was able to chill out after the gun and work on catching Henes, and she got about two seconds behind her at the two mile mark. In fourth place, Westfield’s Sara Freix is working her way into a season that, counter-intuitively, is not going as well as one she prepared for less. D.C. got an individual win in the junior boys’ race, when the Georgetown Day School’s Tristan Colaizzi outkicked Lake Braddock’s Colin Schaefer in the last 150 meters on the track for a 15:41-15:46 win. Schaefer had a six second lead at the two mile mark. If seeing his shadow means six more weeks of good racing, Colaizzi and the GDS Hoppers won’t complain. Schaefer recently moved to Virginia from Las Vegas, and he’s finding the climate to be much more to his liking. One of those teammates followed in third place — Ben Fogg. He hung behind Colaizzi, Schaefer, Bethesda-Chevy Chase’s Dylan Kannapell and Joey Garrett of Delaware’s Tatnall School, before running even with Kannapell right to the finish line, where Fogg leaned for the edge. 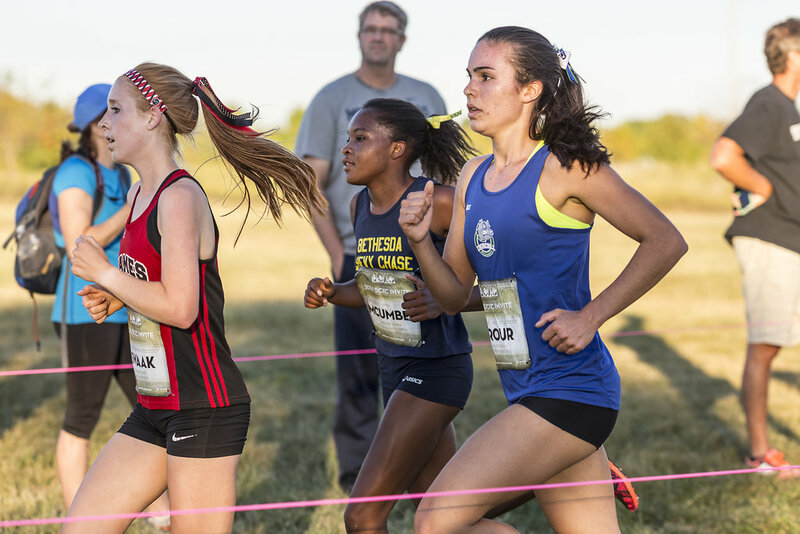 Though Nora McUmber’s state track titles and Nike Cross Nationals berth made her a favorite on paper at the DCXC Invitational, it was a piece of paper that struck some nerves as she prepared for the race. [button-red url=”http://dcxc.s3-website-us-east-1.amazonaws.com/#/home/asrg” target=”_self” position=”left”] Senior girls Results[/button-red]McUmber and James Madison senior Amanda Swaak separated from the rest of the field and came through two miles with Srour in tow with a 10-second lead over Washington-Lee’s Donia Nichols. Then McUmber went for it, and put together enough of a kick to put 33 seconds on Swaak (18:29) and sneak under 18 minutes for a 17:58 finish. Georgetown Visitation’s Emily Kaplan snuck into third place during the third mile in 18:41. Srour enjoyed the race, despite running only a few times the week before, owing to illness. [button-red url=”http://dcxc.s3-website-us-east-1.amazonaws.com/#/home/asrb” target=”_self” position=”left”] Senior boys Results [/button-red]With 12 runners under 16 minutes, the senior boys put on the performance of the night, and despite the top local talent in the race, including 12 of the top 21 seniors in the D.C. area as judged in the preseason by the RunWashington coaches panel, out-of-towner Kevin James of Cardinal O’Hara stole a win in 15:11. Alex Corbett of Lake Braddock led the local contingent, with his 15:17 PR, nearly catching James. He’s not as fast as a number of guys in the race, so Corbett wanted to find a consistent pace that he could manage for a long time, and others could not. That meant being more aggressive during the first stages of the race to make sure he didn’t get trapped in bottlenecks. 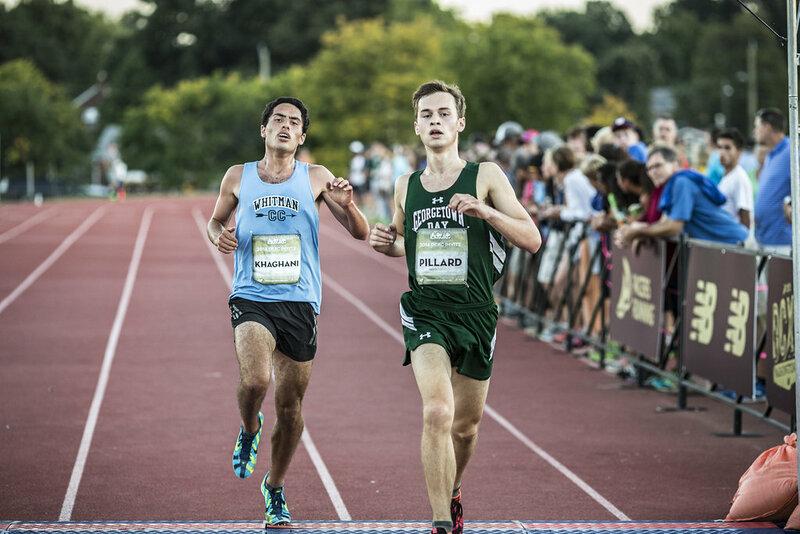 Georgetown Day School’s Aidan Pillard broke 16 by four seconds and was thrilled with his race. At the same second, Walt Whitman’s Amir Khaghani PRed, thanks in part to working without a net. Coach Steve Hays confiscated his watch before the race, which teammate Alex Roederer credited with Khaghani’s success. As did Khaghani.